One of the best things I've done with my AIG class this year has been literature circles. I bought some popular novels through Scholastic to use for the circles. I tried to keep them all science-fiction related so I used Hunger Games, Matched, Divergent, Bar Code Tattoo and Search for Delicious. To get started I had all my students read a summary for each of the books and select their top three choices. I then grouped students based on their choices and reading ability. 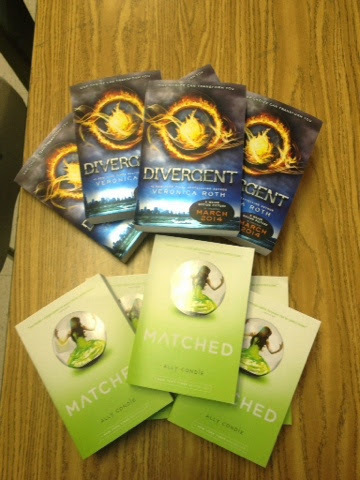 I spent a couple of days introducing literature circles and they could not wait to start their books! Each group was given a blank calendar and they had 3 weeks to finish reading their books. It was up to the group to determine how many chapters they would read a night so that they were finished in times. Groups would discuss every other day. For example, I would have the Hunger Games and Matched groups discuss on Monday and the other groups of Tuesday, then it was back to Hunger Games and Matched on Wednesday. My daily schedule during literature circles always went like this: 15 minute mini-lesson, 30 minutes for the different group discussion (each group usually discussed for 10 or 15 minutes), 15 minutes for everyone to write in their journal and 10 minutes to review the mini-lesson as a class. Mini lessons would vary based on what I saw they needed when I met with their group. I started off with mini-lessons such as asking good questions during discussions and writing a good journal entry. Once students got into the book we had lessons on theme, point of view and other story elements. At the end of every class students were required to relate the mini-lesson to what they had been reading about. I was able to get several grades for literature circles. I had rubrics for their discussions and journal entries that I averaged together. I also had questions to go with each novel that I collected. After the novels were finished everyone took a vocabulary quiz on their novel and then had a few days to work on a final project with their group. 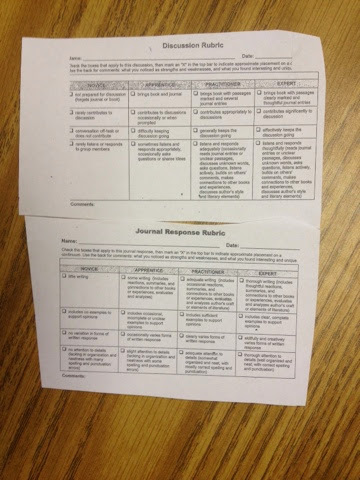 Below is a picture of the rubrics I used for discussions and journal entries. 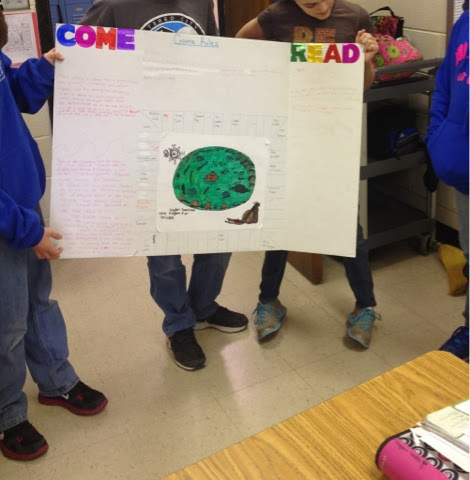 For the final novel project groups were able to be creative on how they wanted to present what they learned as long as it was creative and showed they understood the plot, characters and setting of the story. 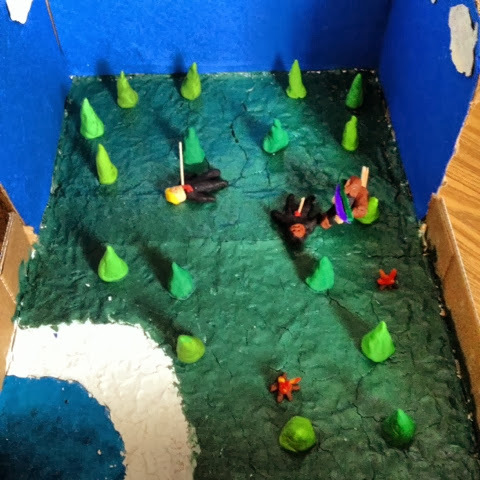 Groups came up with their own ideas and came up with creating an Imovie, skit, clay model and even a board game. 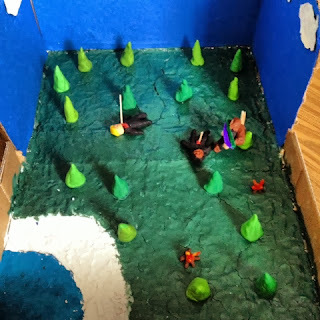 Here is project showing the scene of Rue's death in The Hunger Games. This project shows a plot summary of The Search for Delicious and is also a board game. What I loved the most about literature circles was that students were motivated to stay up with their reading. They knew they would be graded on if they contributed to their groups discussion. They also were excited to get to discuss their books with their groups. At the end of the unit they were asking me if they could read the sequels of the books with their groups. I hope to post some more pictures of things that went on during literature circles soon!